Beijing - The New Zealand government ignored calls by pro-Tibet campaigners at home to snub Beijing over its crackdown on Tibetan nationalists and signed a free trade agreement Monday with China. Prime Minister Helen Clark and her Chinese counterpart, Wen Jiabao, witnessed the signing of the pact - the first China has signed with a developed country - in Beijing's Great Hall of the People. Wen said the signing marked "a day of historical significance" and the two nations had "met the goal" they set of achieving a trade agreement after 15 rounds of negotiations over three years. The agreement would "promote economic growth and bring practical benefits to the two peoples," Wen said. In a government statement released in Wellington, Clark said the agreement was expected to lift New Zealand's exports to China by 180 million to 280 million US dollars a year. The pact provides for long periods of transition to enable sensitive industries on both sides to adapt to the added competition to come from the abolition of import taxes. About one-third of New Zealand's exports to China would become duty-free later this year, another third in five years and 96 per cent of products would be tariff-free by the end of the transition period in 2019. 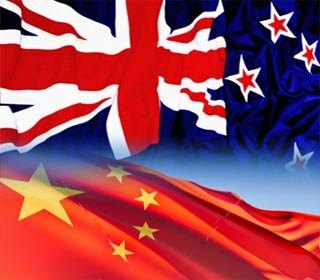 New Zealand's remaining duties on Chinese carpets, clothing and shoes would be phased down and abolished by 2016. A key part of the pact allows up to 1,800 skilled Chinese workers in specialty fields like practitioners of traditional medicine, Mandarin-language teachers, chefs and martial arts teachers to work in New Zealand each year. In addition, up to 1,000 skilled young Chinese a year would be able to enter New Zealand on working holidays. In a bid to appease critics of Chinese labour and environmental practices, Clark said the two countries had also signed binding agreements aimed at encouraging dialogue and cooperation in those areas. Clark's Labour Party-led coalition shrugged off opposition to the pact from the Green and Maori parties in parliament, and Revenue Minister Peter Dunne, who leads the United Future party, turned down her offer to go to Beijing for the signing, citing recent Chinese actions in Tibet. Observers said the pact was Clark's biggest foreign policy achievement since she took office in 1999.